As you will read in this newsletter, albertapatients.ca has just passed its one year anniversary and we are growing daily. The information that you and all your albertapatients community neighbors have provided so far has been insightful and thought-provoking. With the community climbing over 3,100 members, the things you tell us carry even more weight. In the year ahead, you will see us sharing the results through media coverage and in partnerships with other organizations who are truly interested in knowing what albertapatients members think. 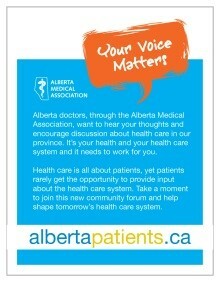 We hope to make albertapatients.ca a widely known and influential voice in discussions about our health care system. Thank you for your time and commitment to this community. An exciting year lies ahead. Last month marked the one year anniversary of albertapatients and we're pleased how far we've come. We're still growing toward our goal of connecting with as many Albertans as possible and truly appreciate the effort that many of you have made to help us spread the word about this initiative. Please read on to the Did You Know section (below) for some details about the community that we found interesting: who albertapatients are, how people are hearing about us, the top three reasons for joining and some of the topic areas of most interest to members. Who are albertapatients: Did you know? A variety of Albertans are interested in sharing their thoughts about health care. More than 3,100 Albertans have joined albertapatients so far, with more signing up every day. Members live in cities, towns and communities throughout the province, and people of all ages are participating: the youngest member is 18 and the oldest is 89. People are hearing about albertapatients through many different channels. Over 40% of members mentioned hearing about us through social media – though many mentioned that they had seen posters and pads advertising albertapatients in clinics, hospitals and health centers, but didn't sign up until they also noticed us on Facebook. 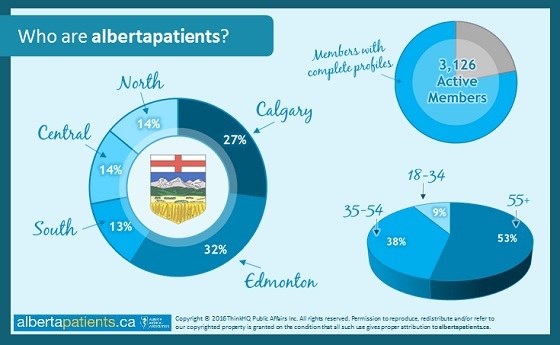 Another 21% of members first heard about albertapatients while searching the Internet or reading health-related websites and 19% read about us in a patient newsletter or communication from their local clinic or the AMA. One in ten members were referred to us by a friend, family member or colleague who had already joined. Members are motivated to help make health care better in several areas. 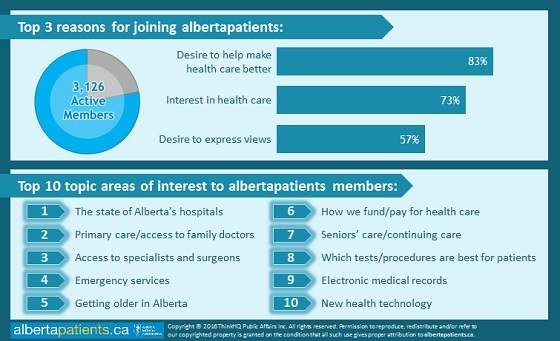 When asked about the main reasons why they decided to join albertapatients, more than 80% said they want to help make health care better, followed by 73% who share an interest in health care and 57% who have a desire to share their views and experiences. Members have expressed interest in discussing a variety of health care topics and prioritize them in different ways, but nearly everyone we have heard from agrees that the state of Alberta's hospitals, primary care/access to family doctors, access to specialists and surgeons, emergency services, and getting older in Alberta are topics of particular interest.